A NASA spacecraft designed to burrow beneath the surface of Mars landed on the red planet on Monday after a sixmonth, 300 millionmile (482 millionkilometer) journey and a perilous, sixminute descent through the rosehued atmosphere. After waiting in whiteknuckle suspense for confirmation to arrive from space, flight controllers at NASAs Jet Propulsion Laboratory in Pasadena, California, leaped out of their seats and erupted in screams, applause and laughter as the news came in that the threelegged InSight spacecraft had successfully touched down. People hugged, shook hands, exchanged highfives, pumped their fists, wiped away tears and danced in the aisles. Flawless, declared JPLs chief engineer, Rob Manning. This is what we really hoped and imagined in our minds eye, he said. Sometimes things work out in your favour. A pair of mini satellites trailing InSight since their May liftoff provided practically realtime updates of the spacecrafts supersonic descent through the reddish skies. The satellite also shot back a quick photo from Mars surface. The image was marred by specks of debris on the camera cover. But the quick look at the vista showed a flat surface with few if any rocks just what scientists were hoping for. Much better pictures will arrive in the hours and days ahead. What a relief, Manning said. This is really fantastic.He added: Wow This never gets old. 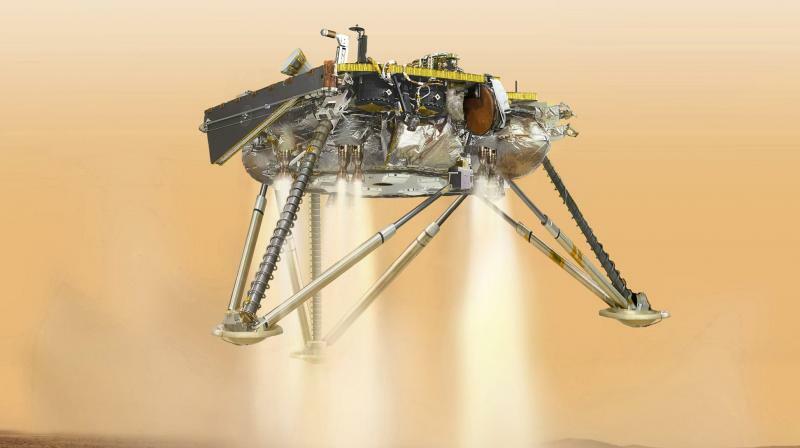 InSight, a 1 billion international venture, reached the surface after going from 12,300 mph (19,800 kph) to zero in six minutes flat, using a parachute and braking engines. Radio signals confirming the landing took more than eight minutes to cross the nearly 100 million miles (160 million kilometers) between Mars and Earth. Viewings were held coast to coast at museums, planetariums and libraries, as well as New Yorks Times Square. NASA last landed on Mars in 2012 with the Curiosity rover. Landing on Mars is one of the hardest single jobs that people have to do in planetary exploration, InSights lead scientist, Bruce Banerdt, said before Mondays success. Its such a difficult thing, its such a dangerous thing that theres always a fairly uncomfortably large chance that something could go wrong. The US, however, has pulled off seven successful Mars landings in the past four decades, not counting InSight, with only one failed touchdown. No other country has managed to set and operate a spacecraft on the dusty surface. InSight was shooting for Elysium Planitia, a plain near the Martian equator that the InSight team hopes is as flat as a parking lot in Kansas. The stationary 800pound (360kilogram) lander will use its 6foot (1.8meter) robotic arm to place a mechanical mole and seismometer on the ground. The self-hammering mole will burrow 16 feet (5 meters) down to measure the planets internal heat, while the seismometer listens for possible quakes. No lander has dug deeper on Mars than several inches, and no seismometer has ever worked on the planet. Germany is in charge of InSights mole, while France is in charge of the seismometer. An ecstatic Philippe Laudet, the French Space Agencys project manager, said at JPL that now that the seismometer is on Mars, a new adventure is beginning. By examining the interior of Mars, scientists hope to understand how our solar systems rocky planets formed 4.5 billion years ago and why they turned out so different Mars cold and dry, Venus and Mercury burning hot, and Earth hospitable to life. InSight has no lifedetecting capability, however. That will be left to future rovers, such as NASAs Mars 2020 mission, which will collect rocks that will eventually be brought back to Earth and analyzed for evidence of ancient life.